Deep Moisturizing: 82% oxygen through atomize nutrition to promote absorption, make lighten skin. Lifting&Firming: photon LED skin care effectly an-aging and stimulate cells growth, thus restores the skin elasticity. Pore Cleaning: skin scrubber can quickly and thoroughly clean up the dirt and ageing horny in the deep skin. The Photon Micro current Beauty Device, designed for facial beautification, uses natural light waves, which are transmitted by LED into the skin. The light activates photoreceptors in skin cells, producing energy for absorption by skin components, to beautify your complexion. Studies show that light enters the body as photons (energy) and is absorbed by the photoreceptors within cells. These beauty care units are used to treat soft tissue injuries and skin conditions such as psoriasis, herpes, leg ulcers, burns, and acne. The spectrum of light is especially effective for treating wounds, cuts, acupressure points or other areas close to the surface of the skin. It balances skin tone and enhances circulation, inhibiting he formation of melanin pigment, fighting acne and dermatitis, and smoothing pockmarks, scars and wrinkles. 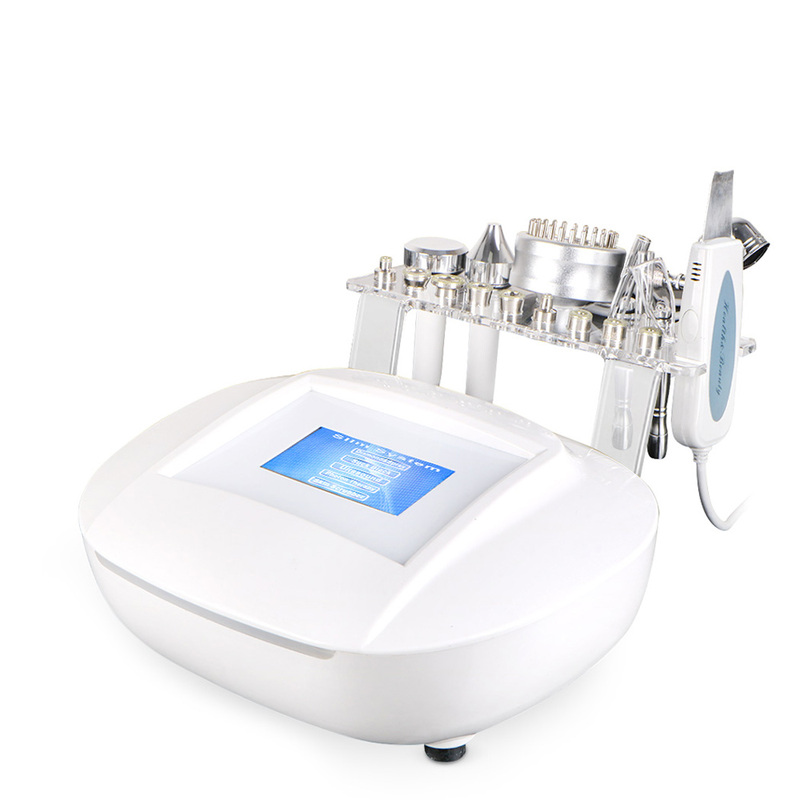 This device can produce 7 COLORS and improve a lot of skin problems. Blue: The 462nm blue light is for calming and diminishing inflammation. Green: The 527nm green light is for comforting the skin. Purple: The 600nm purple light is for toxin elimination. Orange: The 610nm light is for Balancing and recomposing. Turquoise: The 470nm turquoise light is for relaxation. The microcurrent & photon activates in skin cells, and increase the energy of cells’s metabolization in order to stimulate to produce more collagen protein，enhances circulation, inhibiting he formation of melanin pigment. It use on face, like cheek. Ultrasonic scrubber using the high performance of ultrasounds. By removing the superficial scaly layers of the skin, the Scrubber stimulates the revival of the skin tissue rendering it youthful and luminous. It use on face, like cheek.